Taxing trusts as if they were companies, and applying a new top marginal tax rate on incomes over $1 million, would raise billions of dollars for the Commonwealth budget and alleviate pressure to slash welfare programs for the genuinely needy, the Greens have said. The country’s third political force has commissioned an updated independent costing of the two proposals originally put forward by the Parliamentary Budget Office, as an alternative to a raft of harsh spending cuts being considered by the Abbott government. The move has been calculated to illustrate the ways that Australia’s rich and poor are being cast in the Abbott government’s narrative of a budget emergency. These measures have yet to be announced but speculation is rife in Canberra that the first Hockey budget could contain decisions to tighten eligibility for the age pension, make GP visits more expensive through the application of a co-payment by patients of $6, and even see a crackdown on eligibility for the Disability Support Pension. The PBO modelling found the move to scrap the generous taxation treatment of discretionary trusts, of which there are some 550,000 in operation at present, would raise some $3.3 billion over the four-year budget period from July 1, this year. However it acknowledged in its costing documents, obtained by Fairfax Media, that its modelling was “considered to be of low reliability” due to a series of inherently uncertain assumptions about future behaviour. This could include individuals abandoning trusts and using other measures if the taxation arrangements were no longer regarded as sufficiently attractive. Another almost $1 billion would be gained in revenue by the addition of a 5 per cent super-rich tax on the tiny minority of people with incomes over $1 million – defined as taxable income plus reportable fringe benefits. The PBO modelling provided to the Greens party shows this proposal has been costed as adding $926.6 million to the underlying fiscal balance over the four budget years from July 1, 2014. The tax take from this measure would gradually increase through bracket-creep expanding its eligibility and thus causing it to reap $339.7 million in the final year, 2017-18. Acting Greens leader Adam Bandt said it was unacceptable for the government to be shaping up for a major hit on the vulnerable, while the well-off were allowed to structure their affairs to minimise tax, depriving the budget of much needed revenue. “The wealthy elite should take a haircut, not those who rely on bulk-billing to see a doctor,” Mr Bandt said, declaring that Prime Minister Tony Abbott was “backed by society’s ‘1%’”. “If Joe Hockey and Tony Abbott let their millionaire friends off scot-free while attacking pensions and essential services, they will have declared ‘class war’ on the country and divided Australia,” he said. “If the ‘age of entitlement’ is over, as Joe Hockey says, he should start at the top. Joe Hockey should balance the budget fairly by implementing these independent costings provided by the Greens,” Mr Bandt said. The combined effect on revenue of the two measures would be close to $4.3 billion over four years with the potential to raise more beyond the budget period. Trusts run by farmers would be exempt from the Greens’ changes. But the ideas are unlikely to find favour with either of the major parties – neither of whom want to be associated with implementing new taxes. I’ve found that money the Aboriginal Legal Fund needs. 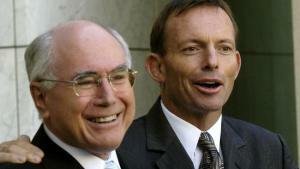 In 1996 John Howard became the first Prime Minister to make Kirribilli House in Sydney his prime residence. Over the next 12 years, this decision cost the taxpayers $18.4 million in flights between Canberra and Sydney. According to the Department of Defence’s Schedule of Special Purpose Flights for the second half of 2002, Howard ordered 43 flights between Sydney and Canberra. Ten of those flights flew empty between Canberra and Sydney. Each flight cost $7500. The RAAF’s No. 34 Squadron operated the VIP fleet of five aircraft, which, in those days, cost $60 million a year to run. The lease on the current RAAF fleet of two Boeing 737 business jets and three smaller Challenger 604 aircraft cost $600 million and will expire this year when Tony Abbott intends to opt for bigger and better planes.